The most intriguing story of the opening day of the NBA playoffs was the Eastern Conference’s No. 8 seed, the Atlanta Hawks — the worst team, record-wise, in the entire postseason — upsetting the top-seeded Indiana Pacers in a 101-93 victory that wasn’t even that close. Although the Hawks have made the playoffs seven years in a row, because they’ve been led by low-key standouts like Paul Millsap, Jeff Teague, Joe Johnson (now with the Brooklyn Nets) and Josh Smith (now with the Detroit Pistons) during that run of success, the franchise has been chronically overlooked. 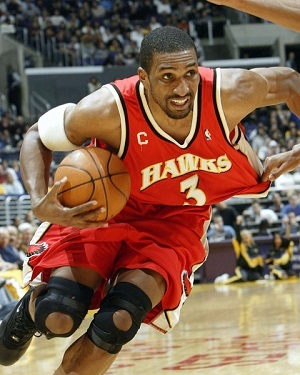 One player who is familiar with being underrated in Atlanta is Shareef Abdur-Rahim. Raised Muslim in nearby Wheeler, Ga., Abdur-Rahim played two and a half seasons with his hometown team from 2001-04. The 6-9 power forward made the NBA All-Star Game once and averaged 20.4 points during his tenure with the Hawks, seventh-best in franchise history. But due to his quiet personality and because the team never made the playoffs while he was there, Abdur-Rahim was rarely given the superstar treatment on a national level, despite being one of the most productive players in the league at the time. Abdur-Rahim’s best game with the Hawks came on Dec. 6, 2003, when he put up 43 points and 12 rebounds against the Cleveland Cavaliers. But anybody who’d seen Abdur-Rahim play knew he could rack up buckets and boards. The more unusual thing about this game is that Cavs rookie LeBron James scored only eight points, one of the few times in his NBA career in which he didn’t score at least double figures. But even with Abdur-Rahim’s dominant performance and LeBron’s subpar showing, the Hawks still managed to lose the game.